2/10/2017–MOCKSVILLE, NC–The NC WING Commander, Col R. Jason Bailey, and the Sugar Valley Composite Squadron Commander, Lt Col Eric Orgain, presented 2 special awards to cadets at the Squadron’s Winter Awards Banquet on 31 January, 2017. 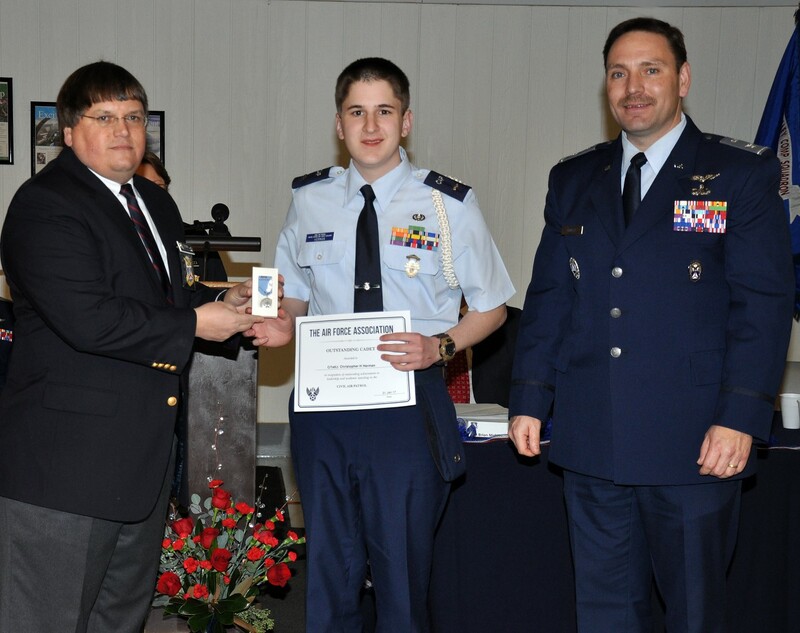 C/1st Lt Christopher Herman earned the Air Force Association's “Civil Air Patrol Outstanding Squadron Cadet of the Year Award.” AFA provides each CAP squadron a silver medal, ribbon and certificate to present to the most outstanding CAP cadet in each squadron each year. AFA is honored to recognize these accomplished cadets. Squadron commanders request award packages based on outstanding performance during the year by any cadet in the CAP Cadet Program. C/SMSgt Ella Orgain was awarded the Silver DAR Outstanding Cadet Medal from the Battle of Shallow Ford DAR Chapter. This medal, with a Campaign Bar and a certificate, is awarded to student cadets of outstanding ability, patriotism, leadership, and scholarship who are selected by the individual Cadet Unit Commanders. The National Society, Daughters of the American Revolution (NSDAR) has 3 different medal categories, and the Silver Medal is for non-ROTC military-affiliated Cadet Programs, including Civil Air Patrol, Young Marines, and Naval Sea Cadet Units. The DAR Medals program began in 1967 with the first presentations to ROTC Cadet Units. Then Bronze Medals to JROTC Units were authorized, and the Silver Medals are the newest category. For the first time, the NCSDAR will have a DAR sponsor assigned to every ROTC, JROTC, and CAP/Young Marines/Naval Sea Cadets Unit for 2017. Congratulations to these two cadets on their contributions to the Squadron, to the NC WING, and to their communities. The Sugar Valley Composite Squadron meets every Tuesday from 18:30-20:30 in the Blue Hangar at the Sugar Valley Airport, Mocksville.